Maintaining proper alignment and controlling motion can resolve instabilities present in the lower extremities. Examples of such include broken bones, arthritic joints, hyperextension of the knee, muscle weakness or paralysis. 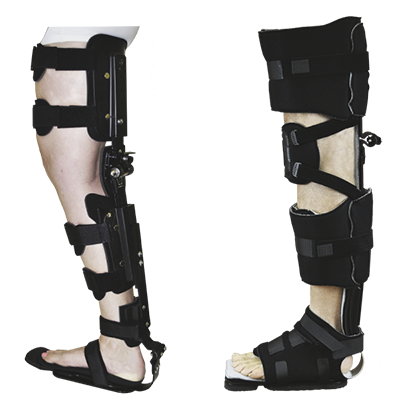 Lower limb orthotic systems provide the support and alignment to correct deformities that improve the ability and quality of standing and walking. Since an individual’s status is always changing and no one case is the same, an orthosis is needed that is proactive in nature and adaptable to their changes whether ambulatory or at rest. A knee-ankle-foot orthosis is an entire leg brace customized to the specific needs of an individual. It spans the length of the knee, ankle and foot in an effort to support the muscles, stabilize the joints and assist safe ambulation. KAFO delivers a wide range of versatility needed particularly in the early stages of neurological rehabilitation patient management, where studies have proven the value of early mobilization and proper anatomical positioning. It ensures superior mobility and comfort with a modern fit, providing better control of the limb. Produced from thermoplastics or carbon fiber composites, it is lightweight and fits more closely. Each component, including the knee joint, knee locking mechanism, knee pads and bands and whether or not there is a frontal plane control is determined by an individual’s condition. In the past, the best option to treat lower extremities with an orthosis would be to wear a KAFO with a locked knee joint. While this provided the necessary stability and support of the knee to prevent involuntary flexion, it simultaneously caused other associated issues such as muscle atrophy, increased energy expenditure in gait and a non-cosmetic walk. Today’s KAFO technology has been re-engineered with an enhanced design that can automatically lock and unlock at the appropriate times in the gait cycle. This allows for a more fluid walking style. There are a number of factors to consider when prescribing and fitting a the device on an individual. These include the type of deformity present, the biomechanical deficit to be addressed, an individual’s weight and activity level and lifestyle issues. Individuals experiencing significant fixed deformity may benefit from a weight-relieving brim in the orthosis, in which the individual’s weight can be migrated from the affected extremity. Once an individual begins wearing their KAFO, it’s advised they wear socks and shoes. Socks or even tights serve as a barrier between the brace and skin to reduce any friction that may be applied and improve comfort when perspiration occurs. It’s recommended to wear a basic athletic shoe with laces or Velcro closures. This allows for adjustments to be made more easily when needed. Each time it is removed, the wearer of the brace should check their skin for any signs of marking or redness. If red marks persist for longer than 30 minutes or the skin breaks down or blisters, the individual should discontinue use of the brace and contact their doctor. You’ve done the initial research and are now considering an orthosis as part of your rehabilitation. With so many makes and brands claiming to be the very best in custom-fit orthoses, how do you know which one is the right fit for you?